It's that time of year again. The 83rd Academy Awards will be airing on Sunday, with all of the usual pomp and circumstance surrounding the event and the nominees. This time around, there has been much ado about the lack of African Americans nominated in front of or behind the camera. Last decade, we had groundbreaking nominations and wins: Halle Berry and Denzel Washington winning best actress and best actor awards in 2002 for Monster's Ball and Training Day respectively; Jamie Foxx's 2005 best actor win for his stunning performance in Ray; Forest Whitaker's best actor win for The Last King of Scotland in 2006; and Jennifer Hudson's best supporting actress win in 2007 for Dreamgirls. It seemed that Oscar had finally found a consistent place in its heart for black actors. Last year the winning streak continued with Oscars for Mo'Nique's best supporting actress role in Precious and for that movie's screenwriter, Geoffrey Fletcher, who made history when he became the first African American to win in the best adapted screenplay category. Then there was Roger Ross Williams' win in the short documentary category for Music by Prudence. But the winning streak came to an abrupt halt this year. 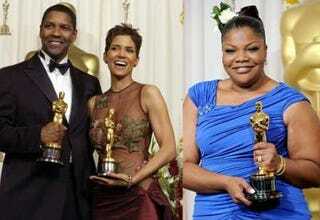 No African Americans were nominated for Academy Awards, even though there were some solid performances. If The Social Network can get nominated, which is one step up from a movie of the week, then why not Tanya Hamilton's Night Catches Us, which was quite excellent? Contrary to popular belief, there were strong films starring black actors and actresses this year. The best were made outside of the Hollywood system, which may be why they were overlooked for nominations at most of the awards shows, including the Oscars. If it weren't for the Independent Spirit Awards and festival circuit, they would get very little love in the film world. Obviously, there were some fantastic performances overall in Hollywood this year, and we're not naive enough to believe that African-American actors should be nominated just to give the awards some diversity. We're merely stating that some excellent performances by black actors were overlooked this year. Maybe there weren't enough slots available, or maybe it was a complete rejection of black film? The only thing sadder than a Hollywood blackout is when there doesn't have to be one. In Night Catches Us, Washington plays former Black Panther Pattie, a single black mother-lawyer trying to save her community while building a loving relationship in the years following the Black Panther era. As Pattie, Washington, who's been putting in hard work in Hollywood for over a decade, is conflicted, anxious, tough, loving, loyal and hardheaded. If Oscar never notices, just know that we do. The Academy Award-winning film The Hurt Locker showcased Mackie's ability to hold his own, playing a stressed-out soldier in an ensemble cast that includes white-hot actor Jeremy Renner and celebrated thespians Guy Pearce and Ralph Fiennes. In Night Catches Us, the Juilliard grad delivers a multilayered, intense performance as a former Black Panther who mysteriously returns to his old stomping grounds, hiding a big secret. The on-screen chemistry between Washington and Mackie is reminiscent of that between Barbra Streisand and Robert Redford in A Star Is Born. Oscar may have snubbed him, but we won't. Evan Ross has been quietly building a solid film career over the last few years. We were first introduced to Ross in 2006 in the film ATL, in which he delivered a scene-stealing performance as Ant, the troubled brother of Rashad, played by rapper T.I. Like Washington and Mackie, Ross has the ability to bring to reality characters from all walks of life in a way that is accessible and believable. In Qasim Basir's Mooz-lum, Ross plays a Muslim college student trying to balance his strict Muslim upbringing with college life in the wake of the 9/11 terrorist attacks. Ross gets it right again, leading the viewer to ponder the precarious position this young man occupies both spiritually and emotionally. Ross should have been recognized for this game-changing role, which shows the complexity of building an identity in a world obsessed with religion and power. Tessa Thompson's turn as an aspirational teenager who winds up pregnant in Tyler Perry's For Colored Girls should not be overlooked because of the inconsistency of the film itself in terms of story line, plot and direction. In fact, there were several outstanding performances in the film, including those of Phylicia Rashad, Kimberly Elise, Anika Noni Rose and Michael Ealy. Thompson stands out because of her ability to hold her own in an arena with seasoned actresses, including Goldberg, who plays her religious-fanatic mother; and Thandie Newton, as her mean-spirited, "loose" sister, Tangie. Thompson's captivating performance as a confused teenager trying to escape the pressure of an overbearing mother and the shadow of a broken sister is the one consistent light in a film that stumbles along. In Mooz-lum, Nia Long delivers a powerhouse performance as Safiyah Mahdi, a Muslim wife and mother who is determined to ensure that her son does not lose his faith amid college life in post-9/11 New York. We've seen Long develop as an actress through a bevy of films, including Boyz n the Hood, Love Jones, Friday, Soul Food, The Best Man, Stigmata, The Boiler Room, Big Momma's House and Alfie. Long is able to work across many film genres in the indie and commercial Hollywood worlds. Her subtle yet powerful performance in Mooz-lum should have been recognized by Oscar. We're sure you can figure out our nominees for best director: Tanya Hamilton for Night Catches Us and Qasim Basir for Mooz-lum. Those two fantastic films were brilliantly directed by newcomers who clearly are trying to tell a different type of story without necessarily having a Hollywood ending.